The literal translation of Pad Kee Mao is “Drunken Noodles” because the theory is that these spicy noodles are perfectly accompanied with an ice cold beer and also that they are a great cure for hangover. I can confirm both cases to be true! This is a very popular Thai stir fried noodles both in Thailand and in Thai restaurants here in Australia. You will be surprised how fast and easy it is to make at home! Drunken Noodles – from the streets of Thailand! Get Pad Kee Mao from the streets of Thailand and unless you have an exceptional spice-o-meter, you’ll be chugging down the beer in an attempt to cool the burn in your mouth. Make this at home and you can control the heat! The amount of chilli I’ve included in the recipe is mild enough for most people (I think), but enough so you can taste the heat. By all means, feel free to turn up the spice dial! 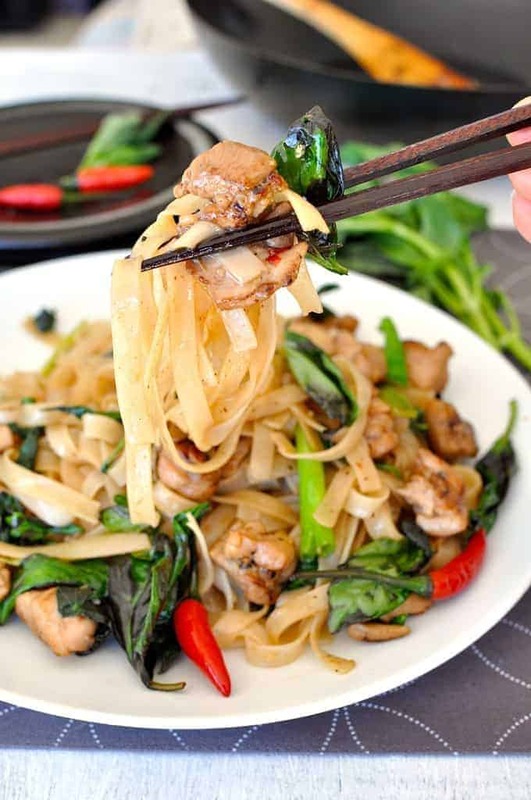 There are all sorts of variations of Drunken Noodles in Thailand and even more in the western world. In Thailand the two constants are chicken and Thai Basil, and quite often it came with baby corn as well, though from my research I couldn’t confirm that this was a “must have” in this dish. Thai Basil is different to ordinary sweet / Italian basil, it has a mild aniseed and mint flavour. Die-hard Thai purists will tell you that you must use Thai Basil or Thai Holy Basil to make this recipe, otherwise don’t bother. I say that it’s not a make or break. This is still worth making even if you can’t find Thai Basil – just use ordinary basil. 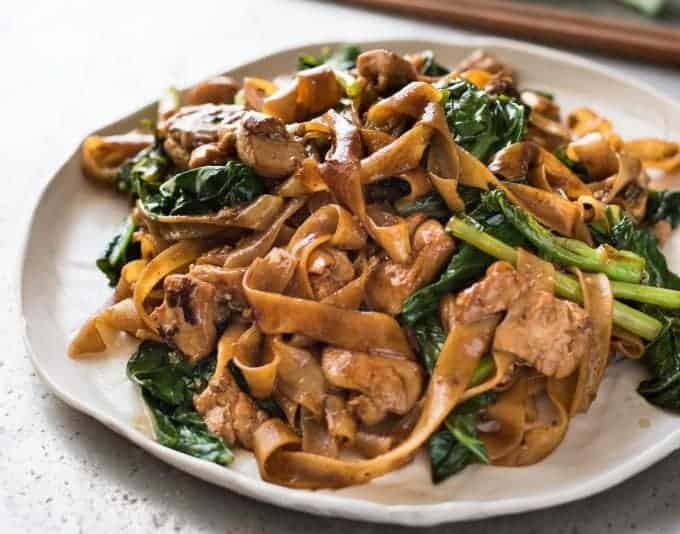 In Western Thai restaurants, Drunken Noodles are usually very saucy, oily and salty – too much so in my opinion, and very different from the streets of Thailand. So it’s really nice to be able to make a healthier yet just as tasty version at home! 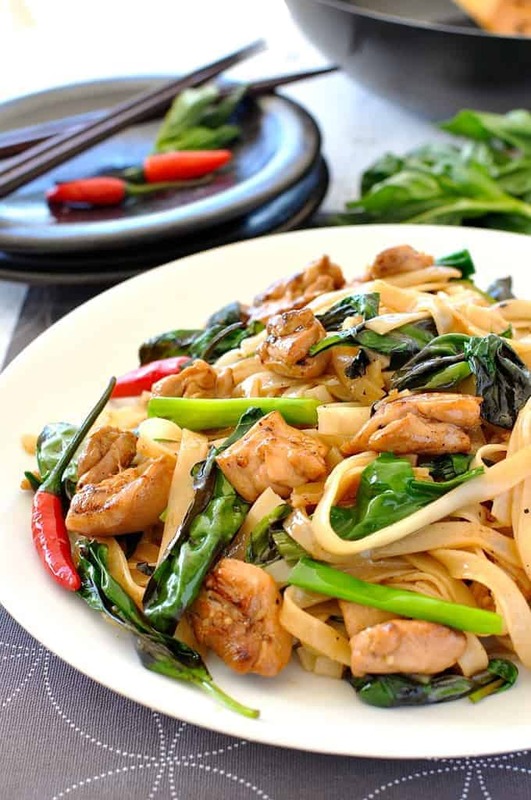 The sauce of this recipe is lighter in colour and not as sweet as that of Pad See Ew (Thai Stir Fried Noodles), one of the most popular recipes here on RecipeTin Eats. Also, Pad See Ew does not have Thai Basil in it, and it is not as spicy. This recipe is also faster and easier to make because there are less ingredients. I often throw vegetables into it – like sliced carrots, cabbage, snow peas and Chinese greens – to make a complete “one wok” meal. The literal translation of Pad Kee Mao is "Drunken Noodles" because the theory is that these spicy noodles are perfectly accompanied with an ice cold beer and also that they are a great cure for hangover. This is a popular Thai takeout dish but it's much healthier and just as tasty made at home. If you throw in Asian greens like Chinese broccoli or bok choy, you can turn this into a one-wok meal. Make sure you have all ingredients ready to toss into the wok as once you start cooking, things happen quickly! Pour boiling water over noodles in a large bowl (or pot) and set aside for 5 minutes (or as per packet instructions), and drain when ready. Heat oil in wok or pan over high heat. Add garlic and chilli and cook for 10 seconds. Don't inhale - the chilli will make you cough! Add chicken and fry until cooked, around 2 minutes. Add the shallots/scallions and about 1 tbsp of the sauce and stir fry for 30 seconds, just to coat the chicken. Add the noodles and sauce and cook for 1 minute until the water evaporates and the sauce has coated the noodles. If your noodles absorbs all the sauce liquid very quickly, this is probably because your noodles were a bit underdone. If this occurs, just add a splash of water (preferably hot) and this not only helps finish cooking the noodles but also revitalises the sauce. Remove from heat and immediately add basil leaves, stir until just wilted, then serve immediately. 1. Light soy sauce is lighter in colour that the normal dark soy sauce but it is actually saltier. If you don't have/can't find light soy sauce, you can substitute with normal soy sauce but the colour of your noodles will be slightly darker and the flavour slightly less salty. 3. Nutrition per serving, assuming 3 servings. If you enjoyed this recipe, I PROMISE you will love my Pad See Ew (Thai Stir Fried Noodles)! 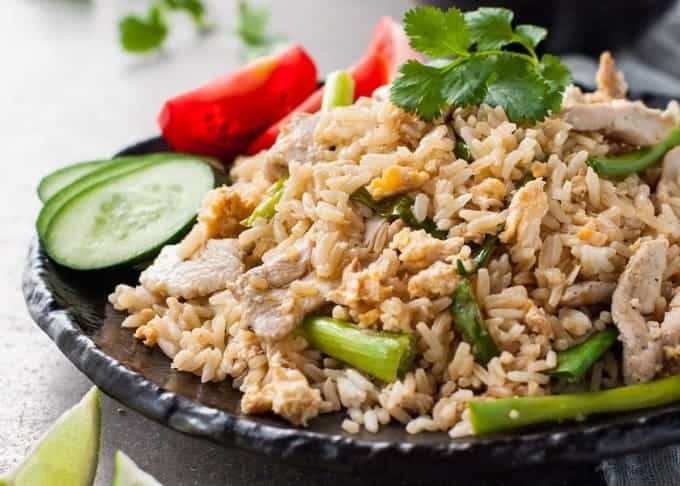 And another authentic Thai recipe – Thai Fried Rice! 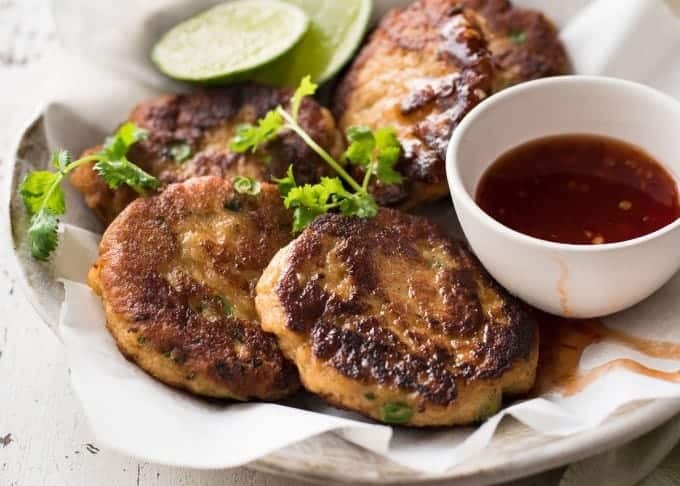 And if you need a starter for your Thai feast, how about Thai Fish Cakes? I really loved this recipe. Thank you for sharing it. The only thing I’d try next time is adding ginger and Fish sauce. It was so yummy and I love how you have notes and comments explaining things! I live in Arizona and it is amazing to me that I can use a recipe someone made in Australia. So ya thank you for sharing! You’re so welcome Lindsey, I’m so glad you enjoyed it! I would rather use beef, what type of meat is used for this dish? The ones I have at restaurants are usually very think and tender. I tried to make this and my dish turned out very “dark” compared to your photo – can I confirm the soy sauce and oyster sauce measurements are correct? ALL your recipes are super tasty 🙂 I’m such a big fan! Yes – I confess I did get my sauces from the supermarket. I will need to also try the Asian market brands soon! If I substitute “Dried” Birds eye chills, how many would I use? I’d love to try this recipe… I’m wondering what “bird’s eye chili” is? Where do you think I might find it? Thanks! I’m in Toronto, Canada. So I’m assuming this would be a fresh chilli pepper – not dried? This looks so good, but are there any unwanted results from using no sugar, or will the sauce still taste good, just more savory? I am very sweet sensitive and seeing the added sugar in all the recipes is a deterrent. But I know sometimes it can be an important part of the flavor composition. JUST LOVE ALL YOUR ASIAN FOODS. I ALWAYS TRUST YOUR RECIPES. CAN’T GET IT ANYWHERE ELSE SO GOOD AND VARIED. OMG a recipe for drunken noodles?!?! Try it try it, it is SO GOOD!!! I’m drooling over these pictures! 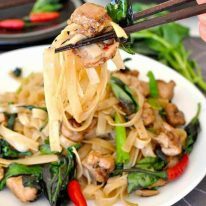 I love your Pad See Ew recipe, the closest I’ve seen so far that’s not from the streets of Bangkok. Since I’m Thai 🙂 I have to disagree with “you can’t tell the difference without Thai holy basil”. Not Thai basil, Thai holy basil. Thai basil has no place in Khee Mao. Those 2 are very different and the dish shouldn’t be call Khee Mao without Thai holy basil. Really great recipe. I added broccoli and tomatoes to the recipe because the “drunken noodles” I’ve had in restaurants usually has broccoli and tomatoes. I added in the broccoli and tomatoes after the garlic and pepper, before the chicken. I also used less sugar (only 1 tsp) and I did substitute 1 serrano pepper for the bird’s eye pepper. I also added salt and pepper to the broccoli and tomatoes right after I put them in the wok, and I also added salt and pepper to the chicken right after it went into the wok. My boyfriend and I both loved the dish! Tasted just like what we order in restaurants, and it was super easy to make. Thank you! I know some people will disagree, but Thai, basil is a very important ingredient in this dish. The flavor of Thai basil is so unique, it’s what gives Thai food it’s unique flavor profile. I am not a food nazi, and make substitutions all the time. But to me, making Thai food, without Thai basil, is like making spaghetti without tomatoes. It just doesn’t work. The one month Asian food challenge on Instagram is a fantastic idea! Ba ha ha! You sound like ME! I make Pad See Ew so often too, even if just the sauce and throwing in whatever I have 🙂 So glad you enjoyed this Pad Kee Mao too! Hi Nagi, thank you for the prompt and kind reply. I just made Pad Kee Mao again, and am enjoying it with an ice cold beer. Perfect dinner! So easy and so delicious! My goal for January 2017 is to try every one of your Asian recipes. Thanks so much for sharing! Any recommendations on a vegetarian substitute for the Oyster Sauce? Hi Alexa! Hoisin works well too, you will get a touch of five spice flavour but it will still be delicious! Could you please recommend some soy sauce brands? I live in Sweden, so it’d have to be one of the bigger ones if I’m to find it here. I used a light Thai soy sauce and a mushroom soy sauce as my choice for the darker one. It turned out really well, but some advice in the soy sauce jungle would be greatly appreciated! Hi Johanna! This is the light soy sauce I use from the supermarket so I presume it is a major brand 🙂 https://www.woolworths.com.au/Shop/Browse/pantry-international-food/asian-food?name=amoy-sauce-light-soy&productId=744053 For my ordinary all purpose soy sauce, I use Kikkoman which I know for sure is a major brand! Hi Nagi, loved the recipe, it was delicious. Big hit with the family. But I’m running into a bit of a problem with the Thai rice noodles. Towards the end I find some of the noodles tend to break into a lot of smaller segments (2-4 inches) as things are get mixed, even when I’m very careful folding things together. Is there a trick to it? I’ve made the dish three times. I’m using Thai rice noodles from my local Asian supermarket; soaking in boiled water for 5 min (not boiling for 5 min). I don’t think the noodles are coming out too al dente or too mushy. However I am doubling up on the recipe. Could it be the volume?